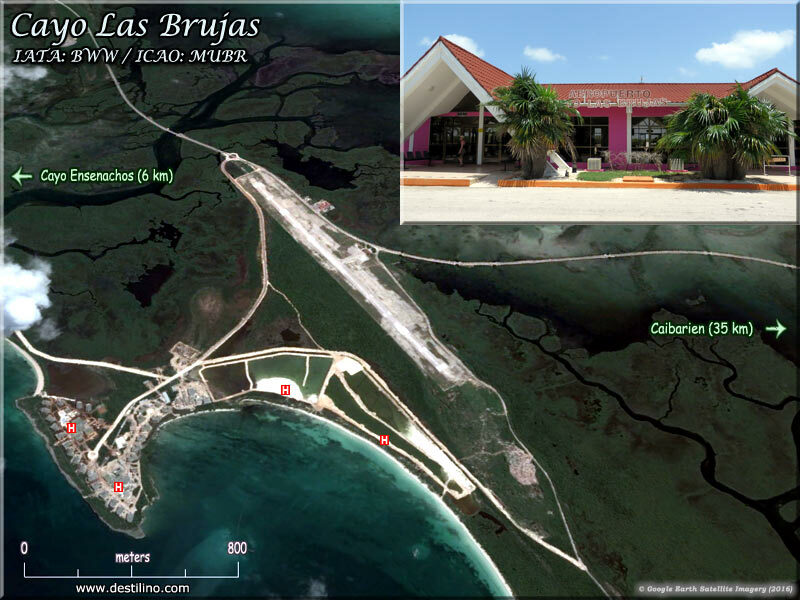 Cayo Las Brujas is a tiny island of about 7 km2 (2.7 sq. mi) located off the northern coast of the Cuban province of Villa Clara. With its two neighbors, Cayo Ensenachos and Cayo Santa Maria, they together form a beautiful and quiet resort destination with amazing beaches, called "Los Cayos de Villa Clara". The names "Cayo Las Brujas" and "Cayo Ensenachos" are however less known because this popular destination is often simply called by the name of its main island, Cayo Santa Maria. While browsing through this website, you will notice that several of the links in the top menu redirect you to our website about Cayo Santa Maria; this is in ordrer to avoid repeating the information that is common to the three cayos. In the Hôtels section of this website you will find information on the hotels (present and future) that are specifically located on Cayo las Brujas, for information on the other hotels of the archipelago, visit our websites on Cayo Santa Maria and Cayo Ensenachos. These cays are connected to the main island of Cuba by a 48-km (30-mi) causeway (called pedraplen in Spanish), from the coastal town of Caibarien. The construction of the Pedraplen began in 1989 and was completed in 1999, paving the way for the development of mass tourism in these cayos. The Cayos of Villas Clara (Cayo Santa Maria, Cayo Las Brujas and Cayo Ensenachos) will reach a capacity of about 13,000 hotel-rooms by the end of 2018. Tourism development started first on Cayo Las Brujas in 1999 with the opening of the first hotel in this region, followed by Cayo Santa Maria (first hotel in 2001) and Cayo Ensenachos (2005). Cayo las Brujas boasts two stunning beaches with fine white sand and crystal-clear turquoise waters.The area is also a world-class location for fishing. There are two international airports serving the King's Gardens: the Cayo Coco Airport, code CCC (Aeropuerto Jardines del Rey) which serves the cayos of the eastern part of the archipelago (Cayo Coco, Cayo Guillermo, Cayo Paredon, Cayo Cruz), and the Santa Clara Airport, code SNU (Aeropuerto Abel Santamaria) which serves the western cayos (Cayo Las Brujas, Cayo Santa Maria and Cayo Ensenachos) and the province of Villa Clara. Are your wondering why the island is called "Las Brujas", which means "The Witches"? There is a very peculiar story behind this name, click to discover the legend of "Las Brujas". With the nearest international airport being located in Santa Clara (the capital of the Villa Clara province), it takes about 80 minutes by bus to reach Cayo Las Brujas from the Abel Santamaria Airport; the first 60 minutes or so are through the Cuban countryside and the towns of Camajuani, Remedios, and Caibarien; and the last 20 minutes on the causeway (el pedraplen) over the sea. The Cuban government has recently built a new road to bypass the village of Remedios. There would also be a project to maybe build a motorway to reach the pedraplen in about 30 minutes, which would allow reaching the cays in about one hour. Note however that the current ride is not monotonous, on the contrary; it gives you the opportunity to visit a bit the region and admire the scenery. Besides, a local guide accompanies each bus carrying tourists to the cayos, he/she describes what we see along the way and talks about the region, the local industries, and about Cuba in general. Our cayolasbrujas.info website has been online since 2009 and our cayosantamaria.info website since 2002. They contain thousands of photos and hundreds of web pages about the “Cayos de Villa Clara”. Our websites are updated regularly, and we humbly believe they are the most complete and detailed source of information about these Cuban destinations. Having no business relationship (or otherwise) with any hotel chain or the Cuban government, our websites are created simply and solely for the purpose of keeping you informed about this beautiful Caribbean island that we had the chance to visit dozens of times.